Rveal just released the new and improved Rveal 2. Check out our review. It features the richest collection of TV shows, live channels, international programs, premium networks, music and even games. It is in a nutshell, all you need to transform your TV set into a mammoth library of your favorite channels, movies and just about anything you would want to watch to tone down a boring day. Keep in mind Rveal comes complete with an upgraded Rveal Air Mouse Remote all in the name of enabling you to control what you watch. It does not end there. You do not have to pay anything monthly. It is a ‘buy once enjoy forever’ kind of deal. Like any other streaming media player, Rveal TV Tuner comes along with a few perks and of course, some downsides. It is, however, important to note that the perks here outweigh the downsides by a huge margin. Very easy to use – The remote makes your work even easier. Scrolling through channels is a downhill task. It gets better with the fact that the interface is in English (not something you can count on when ordering a cheap Android box). Expect easy to navigate drop down menus to make your channel and program selection easy. Aesthetic appeal – You do not come across TV gadgets every day that can complement your other gadgets with ease. But this one does. Its sleek black color and design are simply easy on the eyes. Content for everyone – from cartoons and the latest movies all the way to documentaries and music videos, Rveal TV Tuner has content for all age groups. Customer service – you won’t have to worry should Rveal fail to work or develop a glitch. With Rveal’s US-based customer care service, you can be guaranteed around the clock technical support as well as free warranty. You’re simply covered. Plug, play and enjoy – All you need is a basic internet connection. Set up the gadget with ease, then start streaming. Powered by Android – this simply translates to automatic updates, ease of use and other advanced features that Android-based devices are known for. High price – The initial cost is rather high compared to other Android TV boxes. It retails below $300. The brighter side is the fact that this is just a one-time fee, no subscription required. Also, this includes all future updates and content of the highest quality. Get Rveal Media TV tuner as fast as you can if you do not enjoy what you currently watch. In simple terms, everyone needs it. Who doesn’t want to be entertained? You get everything you want at the click of a button. There is content for everyone. This streaming powerhouse is especially useful for less tech-savvy users looking for simplicity and reliability. Setting up and using the Rveal does not require any previous experience with streaming. You won’t waste any time troubleshooting or looking for reliable streaming providers. It’s an easy, hassle-free streaming solution with no strings attached. Ultra HD and Quad Core Processing – This makes streaming easy for you. It is, in fact, safe to say that with Rveal’s streaming features, the ‘future of television is here’. Think of Rveal as a sizeable streaming box full of infinite applications and programs for everyone under your roof. Like hinted, you only require basic internet connection. You can then choose to stream from anywhere anytime. This may sound like any other perk but it is not. In the long run, you will forget about costly monthly payments in the name of subscriptions. Thanks to the impressive processor, and octa-core graphics unit and 2GB DDR3 RAM, any apps installed from the app store run smooth and responsive. Looking to play some games on your TV? The Rveal is the perfect device for you. LIVE TV – The main thing here is not really LIVE TV but the picture and sound quality of the streams. They are just crisp. You get to flip through a wide range of popular local and international lives channels from anywhere. CNN, NBC, ABC, ESPN, Fox, and CBS are just but some of the LIVE TV channels you should expect. Android based OS – There is something about all gadgets that come along with Android applications. They are easy to use. But that’s not everything. They are easy to update and of course, fun to use. That is exactly what Rveal Media TV tuner is all about. You can be sure of automatic updates. Your TV set will be instantly transformed into a mammoth tablet complete with all popular applications available on Google Play Store. This means you can surf the web and skype if you want to. You can also access Chrome, Facebook, Netflix, YouTube, and much more. Wifi and Ethernet – With the Rveal Android box, running a cable through your living room is a thing of the past. It comes with built-in ultra-fast 5 GHz compatible Wifi to ensure superior streaming quality. However, you do have the option to connect to the internet via an Ethernet port. This is where you will enjoy what Rveal has to offer. The remote is solid and works seamlessly. It feels like one of those hard to find smartphones that come complete with slide-out physical Qwerty keyboards. It also has a good feel as well as a reliable audible feedback. Then there is a learning mode that comes with the remote. It will allow you to learn all the buttons not just on this remote but any other device. You will be impressed with the air mouse and its voice command option. This will make it easy for you to navigate and even type on your screen. 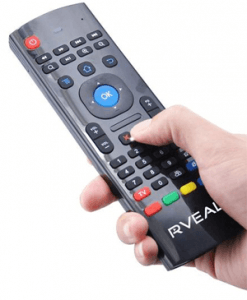 In a nutshell, Rveal Media TV tuner will transform your TV into a computer. As far as features are concerned, Rveal really has everything you would be looking for in a modern TV tuner. Nothing falls short of the modern day tech savvy guy’s expectations. You don’t have to explore what the remote has to offer or even the gadget’s design to appreciate the features. There is the RvealTV application which is already preinstalled on all Rveal boxes. The app keeps the system running and up to date. It is also synched remotely for real-time updates and optimal performance. There is an actual Rveal team that monitors the app platform 24/7. The team also monitors and uploads the most current, top rated and in-demand content. The team simply does all the legwork as far as finding, adding and testing content is concerned. Yours is just to browse, sit back and enjoy all the many options you have. In the dynamic, ever-changing world of online streaming, Rveal is all you need. Then there is, of course, Rveal hardware, complete with high processing Quad Core paired with a reliable Octa Core GPU and 5GHz wireless. This is where one is left with no choice but to describe a product as 99% perfect. Video Playback, as well as Gaming, is way over the roof in regard to graphics as well as speed. No awkward stuttering or lagging with this powerhouse! The sound quality is also on another level when paired with a surround sound system. General responsiveness will leave you impressed thanks to Quad Core Processing and plenty of memory. With this much performance and the choice of millions of apps from the Google Play Store, you have access to a wide range of games available that suits everyone. There are games for the avid teen gamer to his amateur counterpart. It is, in fact, safe to say that entertainment wise, everyone at home is covered with Rveal Media TV tuner around. Rveal Media TV tuner hasn’t been on the market for long but you can already tell it is here to stay. It delivers exactly what it promises. It is not all about the gadget alone. Accessories also speak volumes in regard to how Rveal offers great value for money. To put things in perspective, Rveal users are mostly happy because of the following 5 features. You would hate any gadget that gives you a hard time operating it. Rveal stands out as the main exception when it comes to TV tuners. Like already explained, all you need to do is to plug it in. The rest is really up to you. You do not have to learn anything at all. Whether you will use for LIVE programs, video on demand or gaming, you will have an easy time with all the function keys and dials on the remote as well as the gadget itself. Another perk worth noting here is the fact that Rveal updates and maintains your box remotely for you. This is yet another perk you just cannot afford to ignore. It is, of course, related to the aforementioned user friendliness. The menu you will see on your screen anytime you want to navigate through Rveal media will make everything easy for you. You can move from one page to another or from one function to another without struggling. Moving from streaming to gaming and back to streaming is a button away. Keep in mind that you can also opt to go for voice command. Each key has a one-time function. You, therefore, do not need a set of keys or to press a set of buttons simultaneously to navigate through the main menu. This speaks a lot about Rveal as a brand. They simply care about you. You can get assistance anytime from their customer service, so you do not have to worry that it will take ages before anyone gets back to you. The customer service is there for all your issues ranging from technical and software related queries all the way to simple queries that may not be technical. This is geared to make you buy your gadget with confidence. You can buy with the peace of mind that nothing will go wrong. But in the unlikely event that something does go wrong, you can be certain that you have a 1-year warranty and that someone will listen to your concerns. Rveal is therefore not all about entertainment alone but also about you as a valued consumer. Other competitors offer similar hardware but like you will find out, Rveal takes the medal when it comes to anything that is client related. The last thing you would want to do when looking for a Media TV tuner is to go for a product that may let you down any minute. On the contrary, you will go for a value priced product that guarantees value for money and delivers that promise without struggling. Your choice will have little to do with the price if you know the product will last for long and entertain everyone at home from the infant learning to take first steps all the way to grandpa. You will also take into account the fact that the product will eliminate your monthly TV subscription expenses. That is exactly what Rveal Media TV tuner offers. The bottom line here has everything to do with the fact that Rveal does not really talk much about its product. Little marketing on their side, but buy the product and you immediately realize you have been missing a lot. Also, Rveal does not promise what it cannot deliver. It is one of those brands that lets people decide whether they are on the right track or not. Most importantly, they listen and they care for everyone who buys their products. As said before, it is more than entertainment.